About half of Ireland's population were recipients of public welfare in 2015 according to data from the Department of Social Protection and the European Commission. In 2015 3m recipients of payments from the Department of Social Protection (DSP) were logged and there were 123,000 beneficiaries of the European Common Agricultural Policy. When corporate welfare is included together with suppliers of services and goods to the public sector that are a significant ratio of revenues, the high level of dependence on the State would once have been called socialism! There is double counting in the DSP data while the numbers logged for child benefit are households, but in population terms, there are 569,000 more children than households. Excluding recipients of free travel, electricity discounts, and rent supplement as they would likely be counted elsewhere, results in a net total of 2.4m or 51% of the population. Irish social welfare expenditure was at €20bn in 2015 up 0.7% on 2014 despite a fall in unemployment. Ten years before the cost was €13.7bn — the rise of 45% in 10 years compared with an increase of 8.1% rebased from the consumer price index rise of 5.7% published by the Central Statistics Office (CSO). The welfare budget peaked at €21bn in 2011. Public health expenditure (including capital) grew by 12% in 2006-2015 to €14.2bn. Nevertheless in 2014 according to Eurostat Ireland at 20% had the highest current public health expenditure ratio of total expenditure in the European Union. 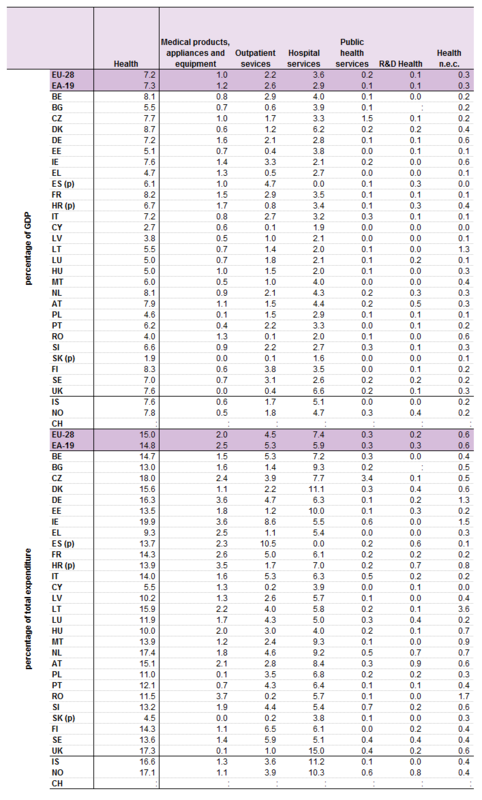 OECD preliminary data for 2015 show that based on per capita public expenditure at current prices, Ireland was at €3,013; €3,511 in Germany; €4,646 (31,260 DKN at average OECD conversion rate) in Denmark; €3,382 (2215) in UK. However, Ireland's total per capita health costs (public + private) in 2015 were €4,355, compared with Germany's €4,130; €3,613 in France; €4,300 in UK; €5,520 in Denmark. Public pensioner numbers in 10 years grew by almost one-third (32%), compared with population growth of 9%. There were 83,895 people of working age paid disability allowance in 2006. That number grew to 112,097 in 2014 and 119,042 in 2015. Total number of recipients of disability payments was 403,000 (see chart below). The number in employment support schemes (activation programmes) grew from 14,000 in 2006 to 76,000 in 2015 — as data for the Community Employment Programme (CEP) dates from 2011 at 22,600 while the CEP is an old programme, the gap between 2006 and 2015 is likely smaller. Rent supplement cost €388m in 2006; €338m in 2014 and €311m in 2015 when there were 57,000 recipients. (1) It is not possible to segregate the nationalities of recipients/participants in respect of all schemes under the Department's remit. (2) In some cases a person can be in receipt of more than one scheme type, for example Rent and Jobseekers Allowance. (3) Child Benefit (Children) numbers are not included in the totals as thes are Beneficiaries no recipients and numbers are included for information purposes only.